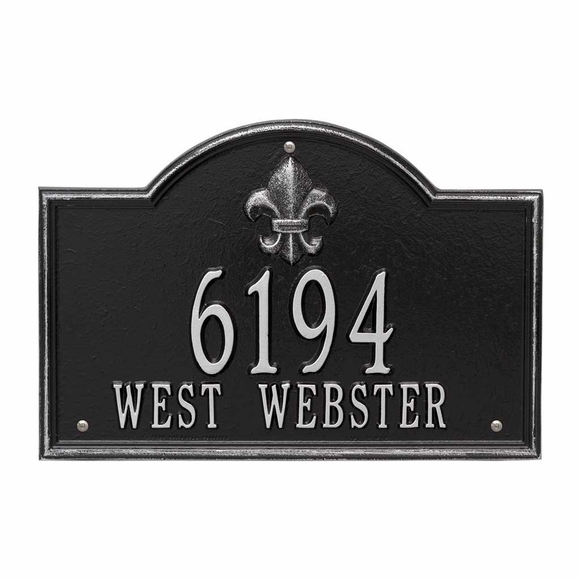 Fleur de Lis Personalized Address Plaque - - includes a 2-line address and fleur-de-lis emblem at the top. Displays the street number and the street name. Made in USA. medium 14.5"W x 9.875"H x 0.375"; weighs 3.25 pounds (first three small images). large 21"W x 12"H x 0.375"; weighs 5.4 pounds (last three small images). Two styles: surface mount on a wall or post and lawn mount with optional lawn stakes. Six colors (shown in small images from left to right): AC antique copper; BG black with gold characters; BS black with silver characters; OB oil rubbed bronze; OG bronze with gold characters; PS pewter with silver characters. Includes the two line address you supply. Line 1 holds the address number up to six (6) 3" characters for medium size sign and up to six (6) 4" characters for large sign. Line 2 holds the street name up to sixteen (16) 1.25" characters for medium sign and up to (16) 1.75" characters for large sign. Wording, accents, and border are permanently cast into the sign. Dimensions medium: 14.5"W x 9.875"H x 0.375". Dimensions large: 21"W x 12"H x 0.375"
To purchase a one-line version of this sign, click top link in Related Products. The fleur-de-lis emblem on this personalized address sign creates a distinctive style reminiscent of French Country and New Orleans.